Numerous archives regarding East St. Louis, IL, have been donated to the museum. The community was founded as Illinois Town, across the Mississippi River from St. Louis, MO. Belleville, St. Louis, and East St. Louis business and industrial connections proliferated in the early 1900's. East St. Louis, a railroad and stockyard center, was home to numerous smokestack industries and realized unusual prosperity during the 20th Century war years. 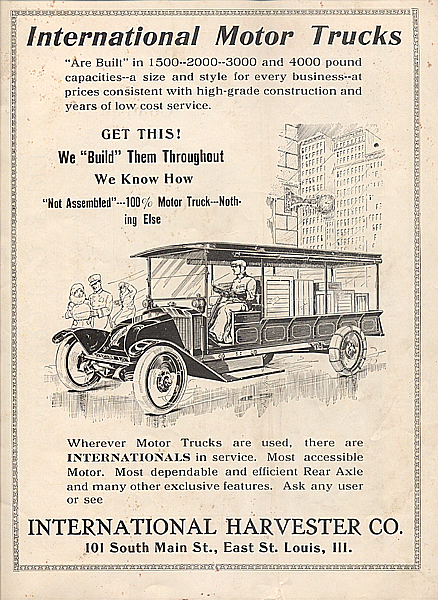 This International Harvester Ad dates from 1918.